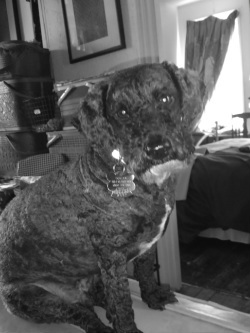 Dorian Gray, our mischievous miniature Schnoodle, loves to give advice, whether you want it or not! Dorian makes up keep a fire king bowl of baking soda by the sink. When you have left over red wine from an open bottle, freeze it in ice cube trays. So, when you are making a quick sauce for pasta, you can toss in one or two cubes to kick it up. My Dandies do this all the time. So can you.